Amateur golfer and Umhlanga resident, Robin Singh, battled fierce competition to secure a winning spot at the Durban regional qualifier in the 21st World Amateur Golfers Championship. Robin arrived enthused and ready to take on the competition at the Cotswold Downs golf course and succeeded in finishing 1st in the 11- 15 handicap group on a well-deserved nett score of 67, cementing his place in the SA National Final. With the second round of the regional qualifiers now complete, the tempo is increasing as excitement builds for the SA National Final that will be played at Selborne Hotel, Spa & Golf Estate on the KZN south coast from 3 – 5 November. This promises to be an exhilarating two-day challenge as the regional qualifiers from Johannesburg, Cape Town and Durban come together in an all out battle for ultimate glory. The competition will be fierce, as each golfer will be looking to claim that coveted TEAM SA blazer and win an all expense paid trip of a lifetime to the 21st World Final in Turkey next month. “The Durban regional qualifier exceeded expectations as golfers arrived on the day poised and ready for an exciting elimination process for this year’s TEAM SA selection. This is a fantastic opportunity for amateur golfers to showcase their talent in the world’s largest amateur golf tournament. 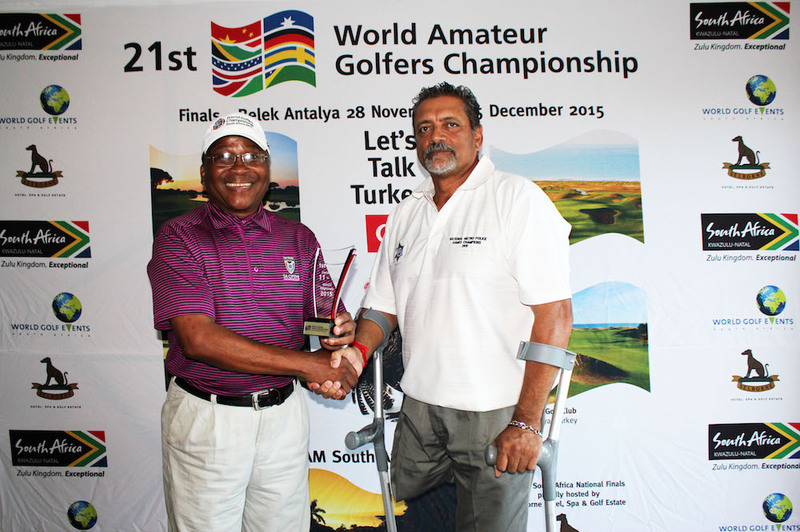 We are looking forward to the SA National Final to see who will be representing South Africa as the defending champions at the 21st World Final in Turkey from 27 November to 5 December,” said Arthur Mzimela of World Golf Events SA and TEAM SA Captain.